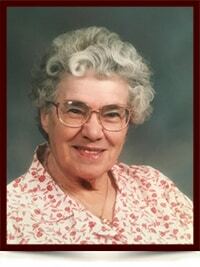 Rose Marie Armstrong - Edmonton's Burial & Cremation Professionals | Trinity Funeral Home Ltd. It is with sadness, that we announce the passing of Rose Marie Armstrong on September 23, 2016. She has shed the shackles of this life and is at home with her Lord and Saviour, Jesus Christ. Rose was born on October 6, 1926 in Lacombe, Alberta. She was predeceased by her husband Thomas Armstrong, parents Marjorie and Herbert Woods, brothers Arthur and David Woods, and sister Hazel Woods. She is survived by her 2 siblings Violet Brankston and Darrell Woods, sons Brian (Shirley) and Kerry, grandchildren Trevor (Alicia), Corinna (Todd), Keith (Gabriella) and great grandchildren Tatte and Monique. In lieu of flowers, donations can be made to the Christian Life Center in Rose’s name.